WHITTIER — Whittier police will join hundreds of other police agencies statewide that will be on the lookout for drivers paying attention to their cell phones rather than the road this month. Authorities arrested a former Los Angeles County sheriff’s deputy Thursday on suspicion of breaking into his ex-fiance’s house, threatening her boyfriend with a gun and punching him while off-duty last year. Reymundo Lainez, 42, of Los Angeles, was booked on suspicion of felony counts of burglary, assault with a firearm and making criminal threats, as well as a misdemeanor count of battery, Los Angeles County District Attorney’s officials said in a written statement. He also goes by the alias Reynaldo Edmundo Lainez, which is the name he was listed under in sheriff’s booking records. “While off-duty on April 17, 2010, Lainez allegedly broke into his former fiance’s Pasadena residence and pointed a gun at her boyfriend. He allegedly threatened the man then punched him,” the statement said. Pasadena police officers took him into custody without incident early Thursday at his Los Angeles home, Pasadena police Lt. Tracey Ibarra said. In the 2010 incident, officers responded to a 9-1-1 call at a home in the 1700 block of Casitas Avenue, where a woman reported her ex-fiance had forced his way into her home through a door, Ibarra said. “They made contact with a female, who made allegations that (Lainez) had pointed his handgun at a male visitor she had at the location, and subsequent to that, punched the victim,” the lieutenant said. Lainez was initially arrested but quickly posted bail, Ibarra said. In recent weeks, prosecutors notified police of their intention to file a criminal case, and an arrest warrant was obtained. Lainez was last assigned to the sheriff’s Temple City Station, sheriff’s spokesman Steve Whitmore said. He was first hired as a deputy in February of 2000. An internal investigation into Lainez was concluded in January, before the district attorney’s office had made a decision on whether to pursue criminal charges, Whitmore said. Whitmore said sheriff’s personnel policies prohibited him from saying whether the deputy had been terminated or resigned. The internal investigation into Lainez was carried out alongside of the criminal probe, Whitmore said. Traditionally, sheriff’s officials have waited for criminal investigations into alleged deputy misconduct to be finished before launching an internal investigation. A recent investigation into a brawl at a Montebello Christmas party among sheriff’s deputies was handled in a similar fashion. An internal investigation into the fight at the Quiet Cannon banquet hall was concluded in mid-March and the department began termination proceedings against six deputies. The investigations are indicative of a changing philosophy toward deputy discipline in the sheriff’s department, Whitmore said. Three months prior to the alleged domestic violence incident, Lainez made headlines for his role in rescuing a badly-burned elderly man from a burning Temple City home. Lainez, the first official to arrive at the scene of the Jan. 29 fire at 10165 Bogue Street, and good Samaritans entered the burning home to pull out an 87-year-old man who had suffered burns to more than 80 percent of his body, sheriff’s and fire officials said at the time. According to sheriff’s booking records, Lainez was being held in lieu of $50,000 bail. No information was available regarding his initial court appearance. If convicted as charged, Lainez could face more than 16 years in state prison. WEST LOS ANGELES — A big rig driver struck and killed a Whittier woman walking by the Santa Monica Boulevard on-ramp to the northbound 405 Freeway Wednesday. Kelly Shimizu, 63, was walking west on Santa Monica Boulevard at Cotner Avenue in a marked crosswalk when she was struck about 10:40 a.m., police said. The 64-year-old driver, a Whittier resident, was driving a 1990 Volvo tractor with a double trailer west on Santa Monica Boulevard. The collision occurred when he made a right turn to northbound Cotner. One trailer struck and killed Shimizu. She was declared dead at the scene by the fire department. There was no evidence of alcohol or drug intoxication and the “collision appeared to be a tragic accident,” police said. Anyone with information about the accident was asked to call the LAPD’s West Traffic Division at (213) 473-0222. RHODE ISLAND — Prosecutors in Rhode Island have brought federal charges against three men — including one from Hacienda Heights and one from Downey — arrested in a nearly $8 million drug bust who authorities have linked to a Mexican cartel. Rhode Island’s U.S. attorney and the state’s attorney general say their offices will cooperate to prosecute the men in federal court. The men had been charged in state court. Federal prosecutors filed a criminal complaint against Armando Saucedo, of Hacienda Heights; Andrew Rios, of Downey; and Adilson Antonio Reyes, of South Ogden, Utah. They are charged with conspiring to distribute over five kilograms of cocaine. Lawyers for the men declined to comment on the charges. The men were arrested following a raid in North Kingstown in January that netted 65 kilograms of cocaine, worth $6.6 million, and $1.25 million in cash. LOS ANGELES — A judge Wednesday sentenced founding member of an Asian street gang convicted of murdering eight people — including three teenagers shot to death on a freeway in El Monte — to spend the rest of his life behind bars. Los Angeles Superior Court Judge Robert Perry sentenced Marvin Mercado, 37, to eight consecutive life terms in prison, Los Angeles County District Attorney’s officials said in a written statement. A jury recommended life imprisonment, as opposed to death, earlier this month. The jury convicted Mercado, whom officials described as a “shot caller” in the Asian Boyz street gang, in February of eight counts of murder and 10 counts of attempted murder. The jury also found true special allegations of gang involvement, gun use and multiple murder. “The charges stem from the defendant’s participation in six gang-motivated shootings between April 1995 and March 1996,” according to the District Attorney’s Office statement. He was arrested in the Philippines in 2007, then deported to the U.S. to face trial in mid-2009. While Mercado remained on the run, seven co-defendants were convicted in 2009 after a six-month trial in 1999. All were sentenced to life in prison without the possibility of parole. Among the victims of Mercado and his cohorts were Cheng Peng, 18, Paul Vu, 16, and Ben Liao, 16, who were shot to death in a car-to-car attack on the 10 Freeway in El Monte on Aug. 1, 1995. Officials said they were mistaken for members of a rival street gang when three cars filled with Asian Boyz gang members followed them away from a cafe on Peck Road and opened fire on them on the westbound 10 Freeway near Temple City Boulevard. The crimes took place in Canoga Park, El Monte, Mission Hills, Reseda and Van Nuys. LA MIRADA — Sheriff’s deputies arrested three drivers on suspicion of DUI and two people who had outstanding warrants during a checkpoint over the weekend, officials said. The checkpoint also netted 24 citations, and 17 vehicles were towed, Los Angeles County sheriff’s Lt. Josie Woolum said. Twenty-one drivers were issued tickets for vehicle code violations, the lieutenant said. “Three additional drivers were cited for marijuana charges after a narcotics dog located the contraband in their vehicles,” she said. A total of 1,820 cars passed through the checkpoint, which was set up about 7 p.m. Saturday at Imperial Highway and Valley View Avenue, officials said. Eighty-five drivers were screened. Of seven drivers examined for possible intoxication, three were ultimately jailed on suspicion of DUI, Woolum said. Two additional people were arrested due to outstanding arrest warrants, she added. Of the 17 vehicles towed, it was not clear how many were being held for impound. The checkpoint was funded by grants through the California Office of Traffic Safety. PASADENA — Officials released no information Sunday about the circumstances of a deputy-involved shooting early Saturday in unincorporated Pasadena. In a written statement, Los Angeles County sheriff’s officials released only that a sheriff’s deputy shot and wounded two white men just before 1 a.m. in the 200 block of South Rosemead Avenue. The sheriff’s statement listed the wounded men, who were expected to survive, as suspects. Officials at the sheriff’s Temple Station said the wounded men had been arrested, but declined to release their names or what crimes they’re suspected of. All questions were deferred to the Sheriff’s Homicide Bureau, however none of the handling detectives could be reached for comment. Sheriff’s officials also would not comment on reports that the involved deputy was off-duty at the time of the shooting. MONROVIA — A Covina woman suspected of two knife-point robberies at the same Charter Oak gas station, as well as a failed robbery in Monrovia, turned herself in Saturday, officials said. Diane Leliott, 41, showed up at the Monrovia Police Department Saturday and was arrested, Monrovia police and Los Angeles County sheriff’s officials said. She was booked on suspicion of robbery. She is suspected of robbing USA Gas, 20354 E. Arrow Highway, in an unincorporated county area near Covina on March 17, then returning to rob the same gas station two days later, sheriff’s Lt. Craig Boyett said. She’s then accused of brandishing a knife while demanding money from a clerk at AM Donut & Yogurt Tuesday, Monrovia police Lt. Nells Ortlund said. She fled empty-handed when the employee did not comply. All of the crimes were captured on tape by surveillance cameras, officials said. She admitted the robberies, Ortlund added, and indicated she committed them to support a drug habit. According to sheriff’s booking records, Leliott was being held in lieu of $50,000 bail and was due for arraignment Tuesday in Pomona Superior Court. WHITTIER — Three elderly men were lucky to escape unhurt after a massive pine tree fell on and severely damaged their house, officials said. The incident was reported just before 1 a.m. in the 13100 block of Walnut Street, at Washington Avenue, Whittier police Lt. Carlos Solorza said. It was unclear what caused the tree, which was owned by the city, to fall, though it may be related to the recent heavy rains, the lieutenant said. 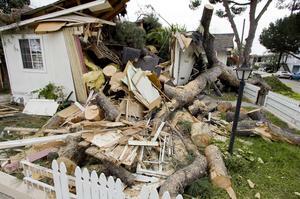 “On the way down it knocked down some power wires, then came down on the house,” Solorza said. Three elderly residents of the home were inside, but none were hurt, he added. “They were lucky to escape injury,” he said. The tree, which was more than 50 feet tall, remained entangled with the home Saturday afternoon, as passers-by slowed to take pictures of the unusual sight. About 50 percent of the home was destroyed, Solorza said. The home was red-tagged and the residents found other temporary lodgings, officials said. PASADENA – A sheriff’s deputy shot and wounded two men early Saturday in an unincorporated county area near Pasadena, authorities said. The shooting took place just before 2 a.m. in the 200 block of South Rosemead Boulevard, Los Angeles County sheriff’s Deputy Mark Pope said in a written statement. The two wounded suspects were hospitalized with injuries not believed to be life-threatening, officials said. No deputies were injured. No further details were released Saturday afternoon.